Palestine's newly accorded observer status at the UN General Assembly is only the latest move in an ambitious gamble to maneuver the ICC in the quest for statehood. The recent Israeli offensive in Gaza, which media channels reported as a ‘war’, was in fact another episode in Israel’s enforcement of its ‘effective control’ over the Gaza Strip, as a long-standing Occupying Power of the territory – a position firmly maintained by the international community. In time of belligerent occupation, such attacks have the purpose of enforcing its control and restoring order. Even when directed against organised acts of resistance mounted by the occupied population, the occupier must account for its inherent control over the territory by using the least harmful means to achieve a military advantage. If Israel’s position vis-à-vis the Gaza Strip is assumed – namely, that it is no longer an Occupying Power in the Gaza Strip since its ‘disengagement’ in 2005 – each and every instance of an Israeli land incursion into Gaza (such as the killing of the 13-year-old boy on the 8 November 2012 that triggered the recent escalation) and any single attack on the territory should be examined under the definition of an act of aggression (elaborated in the General Assembly Resolution 3314); surely an undesirable outcome for Israel. A group of international figures recently held that Israel’s official justification for the use of disproportionate force under the ‘right to self-defence’ during its recent operation is unlawful, as states cannot invoke self-defence for acts that defend an unlawful situation, which they are responsible for creating in the first place. Israel cannot invoke this right – an international norm normally applicable in time of peace – in the on-going international armed conflict with the Gaza district of Palestine, continuing its belligerent occupation while systematically violating international humanitarian law and imposing an unlawful siege on Palestine’s Gaza district, which amounts to collective punishment. Having created a situation that only instigates violence through its own defaults as an occupier, and which has resulted in the emergence of resistance, Israel is prevented from invoking the right to violently repress it, as opposed to reasserting control of the territory and undertaking other means to quell resistance that are less harmful to the civilian population. The same statement also calls on states to impose an arms embargo on Israel, in order to fulfil their obligations not to recognize or assist in violations of international law. Public Interest Lawyers and Al-Haq brought a suit on these grounds in the UK courts for judicial review of the UK’s arms sales to Israel after ‘Operation Cast Lead’, which was denied in 2010 on grounds of judicial deference to UK foreign policy. While the EU and its member states have long asserted a foreign policy interest and a legal obligation to ensure compliance with international humanitarian law and respect human rights – enshrined in EU law through the Treaty of Lisbon – the EU and its member states are only just beginning to review all areas of EU-Israel engagement in line with these obligations. These legal nuances were missing from the barrage of statements issued by Israel’s official military political and military outlets during its recent operation in the Gaza Strip – labelled, in Hebrew, with the biblical phrase, ‘Pillar of Cloud.’ Footage taken by drones and fighter planes, constant updates on social media sites were all geared towards enhancing Israel’s international legitimacy and crafting a narrative of self-defense against ‘terrorism’.In an interesting contrast to this narrative, Israel’s legal strategy since its operation ‘Cast Lead’ in 2008/9 has actually hinged on exploiting the ‘grey areas’ of the law, including the proportionality debate on targeting military objectives and the soldier’s right to life, in order to justify its use of greater force against potential threats. Human rights groups are currently examining physical evidence and collecting testimonies to ascertain the legality of the recent attacks under international humanitarian law, the law on the conduct of hostilities. Once the evidence is in, it will likely be arrayed against Israel’s version of events, sometimes supported by foreign former military officers, claiming the presence of militants and the inevitability of civilian deaths. Israel would not be the first to claim that an accidental civilian death is not a violation, based on necro-economic calculations of the ‘least of all possible evils’. Its position has extensively relied on the necessity of self-defence (jus ad bellum) under the ‘means-end test’ to justify violations of the laws of the conduct of hostilities (jus in bello), often turning these core tenets of international humanitarian law on its head as a result. Since Palestine submitted a declaration in January 2009 to the International Criminal Court (ICC) under Article 12(3) of the Court’s Statute, asking it to exercise jurisdiction over international crimes committed in Palestine since 1 July 2002, Israel has been fully aware of the looming threat presented by the ICC. So much so that in September 2012, the Israeli Turkel Commission, tasked with the appraisal of the ‘Maritime Incident of 30 March 2011’ – the Israeli navy’s attacks on the Mavi Marmara flotilla – and its aftermath, published a legal opinion it had commissioned from a German international law professor, Dr. Claus Kress, on the ICC principle of complementarity, assessing possible deficiencies in national justice mechanisms that should be complemented by the ICC. While it did not discuss the specific application of the principle to the case of Israel, the opinion presents a detailed account of existing practice, while pre-emptively assuming that Israel would not be susceptible to the Court’s jurisdiction. In a recent article, Sharon Weill and I examine Israel’s institutional practice of investigating and prosecuting international crimes, in light of its follow up to the report of the Fact-Finding Mission on the Gaza Conflict (the “Goldstone report”). The analysis concludes that neither states nor the Court can rely on comity – an underlying presumption of mutual-recognition between states in international cooperation – to recognise Israel’s application of international criminal law principles either procedurally or substantively, since its practice has resulted in shielding the high echelons and initiating a small number of low-level prosecutions for mostly minor offenses. A similar conclusion was reached by the Human Rights Council on 25 March 2011, when it called upon the General Assembly to transfer the Gaza Conflict fact-finding mission’s report to the ICC. 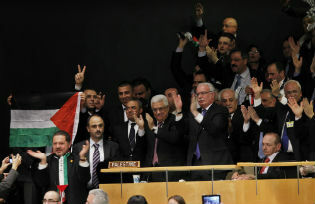 Yesterday, 29 November 2012, the Palestinians obtained‘non-member state observer’ status in the General Assembly, in parallel to the pending application for full UN membership submitted in September 2011, which was shelved by the Security Council in late 2011. Although Palestine has overwhelmingly been accepted as a state, with the official recognition of some 132 states, membership in UNESCO and relations with other international organisations, yesterday’s resolution is a symbolic ‘rubber stamp’ that politically reaffirms Palestine’s existing status as a state. The resolution was voted for by 138 states (with 9 against and 41 abstentions), including some EU states that have yet to bilaterally recognise Palestine as a state. Some – including Human Rights Watch, who does not refer to the declaration in its call for Palestine’s ratification of the ICC Statute – seem to believe that the resolution was a precondition for Palestine to be able to ratify ICC Statute –a proposition that is neither correct nor relevant to the path Palestine has chosen to trigger the Court’s jurisdiction. The resolution provides ‘fresh evidence’ for the Prosecutor whose dubious decision from April of this year groundlessly held that it is the UN and the ICC Assembly of State Parties to determine whether Palestine is a state in the context of its consideration of Palestine’s Article 12(3) declaration, seeking to trigger the Court’s jurisdiction as a non-state party to the Court’s Rome Statute. This decision was clearly geared towards avoiding a serious examination of Palestine’s case and removing it from the Court’s docket, while making legal and factual mistakes in deferring the matter to other international organs, as has been discussed by Professor William Schabas, Michael Kearney and Chantal Meloni, amongst others. Importantly, this path is distinct from a prospective ratification of the Statute by Palestine, not only because it grants the Court retroactive jurisdiction over Palestinian territory from 1 July 2002, otherwise only applicable from the moment of ratification, but also because the decision-making power to accept such a declaration is in the hands of the Court, including the Prosecutor, as opposed to the UN Secretary-General. Palestine was eligible to ratify the Statute as of November 2011, by virtue of its UNESCO membership, as per the Summary of the Practice of the Secretary-General as Depositary of Multilateral Treaties, which considers ‘all states’ to be entities who are members of a UN specialised agency. The UN bid and its prospects for the exercise of the ICC’s jurisdiction in Palestine have become the focal point of Israel’s efforts to contend with the proper application of international law. These efforts recently manifested in Israel’s twists and turns before the US administration to amend yesterday’s General Assembly resolution; although to no avail. Amid discussions on the EU’s position, the British government distinguished itself by conditioning its support on Palestinian assurances not to turn to the ICC under the pretext that doing so would jeopardise the ‘peace process’. This proposition and its intended result are however misleading. Strictly legally speaking, a state’s right to join international treaties and organisations cannot be neutered, either through political agreements, nor General Assembly resolutions, at least not in accordance with international law. Michael Kearney has stated: ‘Premising recognition of statehood on a condition that you absent your new state from rights or responsibility under international law is to make a mockery not just of the process of statehood, but of the very notion of human rights.’ Those who maintain this stance forget that the ICC is the only remaining international justice mechanism left to redress the accountability gap in the Palestinian-Israeli context –particularly since universal jurisdiction laws have been ceded to prosecutorial politics, partly due to the very Palestinian efforts that sought to gain access to international justice. The reaction of EU states to the symbolic General Assembly vote is a strong indication of the fact that it is high time for states to ensure the proper application of international law to the question of Palestine, which has long remained on the periphery of international law. While some have warned of the political dangers of the ICC wading into the Palestinian-Israeli context, and the likelihood of Palestinian violations being first in line – most probably together with Israel’s war crime of transferring, directly or indirectly, its civilians into occupied territory – Israel’s narrative is becoming increasingly unconvincing. Any further obstacles to Palestine’s access to international justice can only result in a suicidal move for both the integrity of the international legal order and the legal orders of individual states. Valentina Azarov is a lecturer and head of the Human Rights and International Law Program at the Al-Quds Bard College, Al-Quds University in Palestine. She worked formerly as a legal researcher with Al-Haq on the Palestinian statehood initiatives file.